A taxonomy, simply put, is a system of classification. Researchers create taxonomies so that they have a shared lexicon for talking about complex systems. A good example of a taxonomy is the periodic table of elements, presented by Dmitri Mendeleev (1834-1907) to the Russian Physico-Chemical Society and published in the Zeitschrift fϋr Chemie in 1869. The Periodic Table has been developed and expanded since then, but the system that Mendeleev presented gave scientists a core system for thinking about and discussing some of the basic building blocks of the universe. The table groups elements by their atomic number and gives a sense of the behavior of each element by organizing them in rows and columns. The periodic table is just one important taxonomy which researchers use. Another is the Global Boundary Stratotype Sections and Points (GSSP). The GSSP is the taxonomic system that could potentially include the Anthropocene epoch. Since the GSSPs are referenced throughout the readings in this primer, we have included this summary to help you make sense of what they are and where the Anthropocene fits in to the overall picture. The taxonomy for the GSSP is maintained by the International Commission on Stratigraphy (ICS). Their system links chronological periods to geological strata. Each geological layer, indicates large-scale historical planetary transformations. For example, mass extinction events are indicated by fossil records — or lack thereof — embedded in the strata. In linking geological strata to chronological periods, the ICS has developed the following nomenclature. The table below describes two ways of classifying the earth’s strata and the chronologies associated with it. The first column, geostratigraphy, refers to the layers and sublayers of strata — the physical rock. The second column, geochronology, is based in empirical research but is more abstract than geostratigraphy, referring only to a time sequence. So, for example, an Eon is a period of time, while an Eonothem refers to a stratigraphic section that represents that period of time. This distinction is somewhat redundant, and some researchers have argued for collapsing the geostratigraphical categories into the geochronological categories (see, for example, Zalasiewicz J., et al. Simplifying the Stratigraphy of Time. Geology 32, no. 1 (2004): 1– 4). The Anthropocene is a geochronological category. So, it is important to understand how geochronological categories work. You might think of these categories as a nesting hierarchy. An Eon is the longest timeframe while an Age is the shortest timeframe recognized by ICS. An Eon may include many eras, and an Era may include many Periods. However, a Period will never encompass an Era, and an Era will never encompass an Eon. An easier way to think about this is to refer to the geochronological/geostratigraphical taxonomy created by ICS. Cohen, K.M., Finney, S.M., Gibbard, P.L., and Fan, J.-X., 2013. 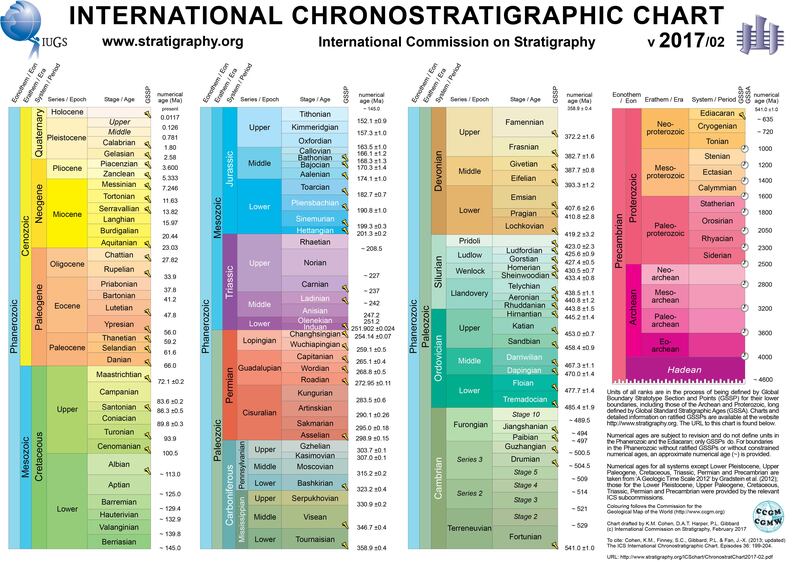 The ICS International Chronostratigraphic Chart. Episodes, 36(3): 199-204. Using this chart, you will note that ICS has formalized only four Eons: the Hadean, the Archean, the Proterozoic, and the Phanerozoic. Looking more closely, you will see that we currently live in the Phanerozoic Eon, the Cenozoic Era, the Quaternary Period, and the Holocene Epoch. As mentioned above, the ICS is debating new nomenclature for the Epoch in which we live, the Holocene. The debates surrounding this proposed revision reveal two important points about this geological taxonomy. First, the geochronological system is constantly being revised to reflect new discoveries and new interpretations of these discoveries. Second, these revisions are not value neutral. They exist within professional, social, economic, and political debates. This is especially true in the current debate over creating a new Epoch — the “Anthropocene”. Of note are Noel Castree. “The Anthropocene: A Primer for Geographers,” Geography 100 (2015): 66–75; Jeremy Davies, The Birth of the Anthropocene (Oakland, California: University of California Press, 2016); J. R. McNeill and Peter Engelke, The Great Acceleration: An Environmental History of the Anthropocene since 1945 (Cambridge, Massachusetts: Belknap Press, an imprint of Harvard University Press, 2016); Jan Zalasiewicz, The Earth After Us: What Legacy Will Humans Leave in the Rocks? (Oxford: Oxford University Press, 2009).